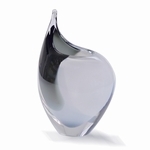 Our special gift ideas include a number of imported crystal designs. 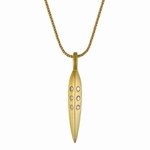 We also created a special pendant to celebrate 15 years of marriage... an original Gold Facet Pendant with 15 handset diamonds! Why crystal for a 15th anniversary? The Traditional Anniversary Gift List suggests crystal for a 15th anniversary. Crystal is a high quality, cut glass. Originally it was made with a high lead content to increase brilliance. 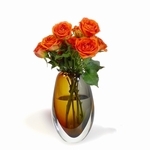 More recently, �crystal� is used as a general term to describe fine glassware. Glass is an amazing material on its own, with fascinating properties� It can be transparent, translucent or opaque. It can be blown or cast into shapes. Add in the care that goes into cutting and shaping the glass into crystal, and its uniqueness grows even more. Crystal is often used in fine glasses, pitchers, and platters. It can be used in candlestick holders or for glass vases. It can also be crafted into collectible art objects, to be admired simply for their beauty. Crystal has connotations of sophistication and tradition� with crystal often being passed down over generations.